That’s right, our newGive your Cat a Bowl line uses an ordinary bottle, such as an empty soft drink bottle to evenly dispense water to your pet without them going thirsty. Simply fill a bottle with water, and screw into the bowl. 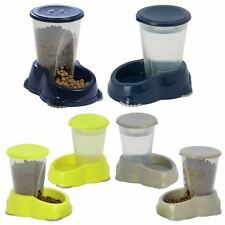 plastic timer ensures automatic opening at the set time for one meal of 300 ml 48 hr timer also usable for wet food includes 1 ice pack for keeping food fresh, to place below food dish non-slip due to rubber feet easy to clean battery-operated (1 AA mignon batterie not included) . This automatic double pet feeder made of a durable plastic is suitable for small dogs and cats. TX2 Automatic Twin Pet Feeder. This is one double feeder, both bowls attached to each other and cannot be separated to make 2 singe feeders to feed 2 different cats who don't like to eat side by side. FEATURES Designed for multi-pet homes to stop pets stealing each others’ food Ensures that prescription food is consumed by the right pet Great for pets on weight management diets Compatible with all identification microchips worldwide & SureFlap RFID collar tags Works with the SureFlap RFID collar tag (one tag included) Suitable for both wet and dry food. Bowl capacity 400 ml or two pouches of wet food Sealed bowl keeps food fresher and free of flies 6 months battery life (4 x C cell batteries - not included). A low battery indicator will flash when the Colourful bowls and mats available to purchase separately (1 x grey bowl, 1 x grey split bowl, 1 x grey mat included) Stores up to 32 pet identities in memory. 1 x User Manual. It then automatically closes when the cat moves away, preventing all other animals and children gaining access to their food. 1 x Microchip Pet Feeder. Feeder opening-Size of the area that your pet will eat from 8 1/4" (W) x 6 1/8" (H). Not compatible with PetSafe Wi-Fi feeder. With two cats/dogs that don't share a single bowl well, this adapter is just what you need to feed both cats/dogs at once. Expect a nice snug fit to the feeders dispenser and equal portions in each bowl! SureFeed Sealed Pet Bowl - For Dogs & Cats, Motion-Activated Lid The next Generation of Pet Bowl. SureFeed spoke to pet owners to discover what problems they most commonly experience when feeding their cats and small dogs. Their feedback consistently revealed the following issues: 1. Pets don’t like to eat food that has been left out for a long period of time 2. Owners dislike the smell of pet food in their home 3. In hot weather pet food left in open bowls attracts flies into the home The SureFeed Sealed Pet Bowl was designed to address all of these issues. 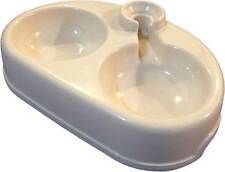 Its unique bowl features an integrated seal which makes contact with the product’s lid when it is not in use. Because the bowl keeps food fresher for longer, it reduces the amount of wasted food thrown away. Powered by [eBay Turbo Lister] (https://pages. Electric Adapter: ADAP Healthy Pet Simply Feed ROHS Model G402-15252. You and your pet were made for each other. The feeder is made of BPA-free plastic and stainless steel. Automatic Dog and Cat Feeder. For Use with Dry Pet Food / Kibble / Treats Only. Programmable Automatic Feeder Dispenser. Large Capacity Pet Food Hopper Bin for Multiple Feedings. Digital Pet Food Dispenser. Integrated Feeding Bowl. PetSafe PetPod Digital Pet Feeder. Battery operated with two dishwasher safe feed trays, each holding up to 200 g of dry food. Every pet needs to eat and drink. This is how cats and smaller dogs would choose to eat, little and often. Petsafe Frolicat Flik Automatique Chat Teaser Corde Jouet PTY17-14233 CAD 41.11. The easy to read LCD display and dishwasher safe feed tray make this feeder user-friendly and easy to operate. Each section holds up to 230 g of dry food. 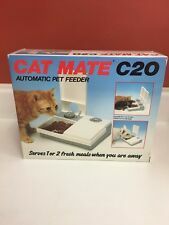 CAT MATE C20 AUTOMATIC PET FEEDER THE CAT MATE C20 IS DESIGNED TO FEED ONE OR TWO CATS, KITTENS OR SMALL DOGS WHEN YOU ARE AWAY - DURING THE DAY, EVENING OR OVER THE WEEKEND. FOOD IS KEPT FRESH IN TWO EASY-CLEAN COMPARTMENTS SEALED BY CLOSELY FITTING LIDS, AND COOLED BY A BUILT-IN ICE PACK. JUST SET THE TIMER ON EACH LID TO OPEN AT THE REQUIRED TIME, UP TO 48 HOURS LATER. ---TWO LARGE FOOD BOWLS EACH HOLD 450G (1LB) WET FOOD ---EASY-CLEAN, REMOVABLE, DISHWASHER-PROOF LIDS AND BOWLS ---ICE PACK HELPS KEEP FOOD FRESH ---FOR DOGS, FEEDER MAY BE EASILY ATTACHED TO A WOODEN BOARD --- EASY-TO-USE 48-HOUR TIMER GIVES 12 MONTHS BATTERY LIFE. (REQUIRES 1 X AA/LR6 BATTERY). With two cats/dogs that don't share a single bowl well, this adapter is just what you need to feed both cats/dogs at once. Only compatible with the Pet Feedster PF-10 PLUS CAT - Automated Pet Feeder for Cats (ASIN B01N9D4672 or B00DFD13VE). 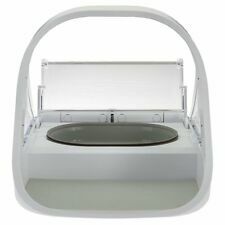 Sureflap Surefeed Sealed Pet Bowl in White. Airtight pet feeder. Prevents flies landing on the pet food. For dogs, feeder may be easily attached to a wooden board. Two large food bowls each hold 450g (1lb) wet food. It's great for single or multiple pet households. Key Benefits. Trixie TX1 Automatic Pet Feeder. 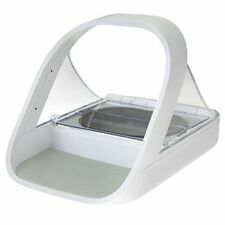 This automatic pet feeder made of plastic is suitable for small dogs and cats. also usable for wet food. Gravity fed feeding design replenishes your pet's food supply when it reaches a low level Antimicrobial material helps prevent the growth of stain and odor-causing bacteria; Note: Please do not put in the dishwasher. The PET plastic material is not made to withstand high temperature. Crafted of durable, impact resistant and easy to clean PET plastic. Excellent option for single or multiple pet households. Keep food up for grabs 24/7 Recessed handle area for easy carrying; Non-skid rubber feet keep it stable in place . We keep tabs on your inventory so you don’t have to! No buttons, no worries. Our automatic STOP cover creates healthy eating habits, prevents overeating, and theft of food from sibling pets. Whello Smart Nutrition. They last 8-12 hours after removal from the freezer. As such, we have a huge wealth of experience in online trading. At present we list nearly 5,000 specialist aquarium & pet products suitable for Aquatic, Reptile, Cat and Dog enthusiasts. Has a clear container to view levels of contents. Wide unit base help prevent tipping and; with wide openings for filling; cleaning is a breeze! Perfect for all size pets from small to extra large. Product Description The CAT MATE C3000 feeder is designed to ensure your pet’s recommended dry food allowance, in order to minimise the health risks and costs of overfeeding. Our carefully developed dry food feeder allows you to program up to 3 individually sized meals over a day and will allow meals to be served in advance of their programmed times, if required. Alternatively, the feeder may be used manually to serve accurate meals on demand or in a frequent feed mode for pets with specific dietary requirements, e.g. diabetes. ---Easy to use, programmable LCD control. ---Battery powered. 4 x ‘C’ batteries (not supplied) give approximately 12 months operation. ---Pet-proof, snap lock lid and feed outlet. ---Maximum 3Kg (6.5lb) capacity food hopper (approximately 1 month for 1 cat). Cat Mate C300 Automatic Pet Feeder - YouTube. Cat Mate C300 Automatic Feeder at a glance With battery life level indicator. The cover of the automatic food dispenser and the feeding bowl itself can all be removed for quick, easy and thorough cleaning. Serve it up in one swipe! Make sure your furry friends are happy, healthy and well-fed - even when you are away from home. More than Automatic Feeding. The Smart Feeder that delivers the right nutrition at the right time and keeps you connected to your pup from anywhere. Want to make sure your dog is fed right whether you are at home or on the go? Ditch the scooping and worrying with the Wagz™ Serve Smart Feeder that delivers the right food to the right dog-at the right time! Download the free Wagz app to set feeding schedules and portion sizes for one or multiple dogs. The unique Smart Pendant knows which dog is at the feeder and how much food they need, automatically dispensing food at the proper time. There is also built-in video and audio so you can check to see that your dog is eating properly when you are away. The Pet Feeder is battery operated with two dishwasher-safe food trays, each holding up to 200g of dry food. Manual override. Battery operated with battery level indicator. Cats, small dogs. Automatic Pet Feeder for Cat. Give the gift of predictability and healthy, by setting the feeder to give out the perfect amount of food for your kitty's ideal bodyweight. Set the feeder once and you finally have the freedom to stay out a bit later, take a weekend trip, or simply NOT be woken up by a hungry kitty at 4 AM. Airtight pet feeder with built-in motion sensor. Suitable for cats and small dogs. It's especially suitable for cats and small dogs. The device can be adjusted to suit to its surrounding area and is easy to handle. Pet Water Drinker Flower Fountain uses running water. Water pump flux: 120L/H. The Pet Water Drinker includes a dual-action water softening filter that continuously purifies and softens hard tap water. Product type: Automatic pet feeder. -Feeder serving size: 400 g. And the TRIXIE water dispensers provide nice fresh water. -Pet type: Dog. -Pet identification: Y. We are here to help! -Automatic closing: Y.
Andis Lithium Titanium Foil Cordless Shaver. Health & beauty. Key information. Changed your mind?. All orders above £30. Vacuum Cleaners. Box Contains. Exclusion apply. SereneLife - SLAPF30. Programmable Automatic Feeder Dispenser. Large Capacity Pet Food Hopper Bin for Multiple Feedings. Digital Pet Food Dispenser. Pet Food Storage Capacity: 7 Liters (7 lbs.). 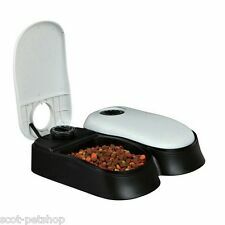 Adjustable Pet Food Dispense Amount & Daily Dispense Frequency. Only they will be able to open the door, all others will be kept out! Prevents children playing with cat food. Non-allergenic stainless steel bowl. Dishwasher safe bowl. Easy cleaning. The Aqua Buddy is made from durable polypropylene, is easy to clean, and is sun resistant. The Aqua Buddy uses an internal float and valve system. As the bowl refills, the float rises and closes the valve. Feeder may be easily attached to a removable wooden board for stability. We are here to help! 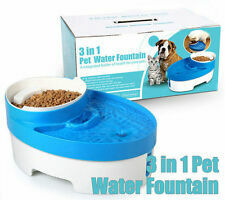 AUTOMATIC PET DOG CAT FEEDER WATER BOWL. ONLY BLUE IS AVAILABLE Now . We will get back to you as soon as possible. Perfect Feeder for dogs,cats and rabbit. This drinking fountain will provide pet healthy water, and the device can recycle with the removable bottle. 2 feed bowls in 1 feed point (water dry feed).